The area of stronger storms in Hurricane Norman have expanded over the last several day in infrared NASA imagery as the storm intensified. Stronger thunderstorms circled Norman's center in a thicker ring on Sept. 6 when NASA's Terra satellite passed over the hurricane. On Sept. 6, Major Hurricane Norman was east of the Hawaiian Islands and tracking toward the west-northwest. 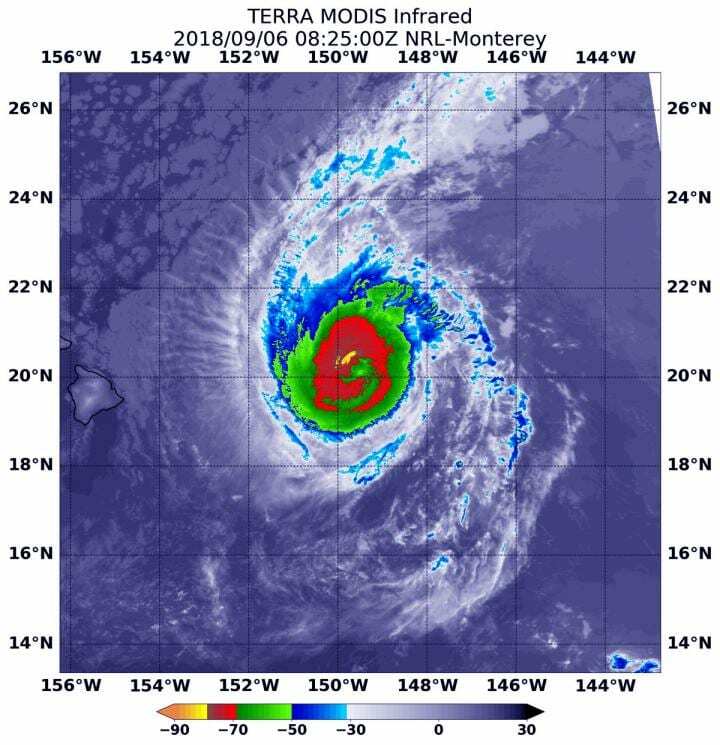 Although there are no coastal warnings or watches in effect, NOAA's Central Pacific Hurricane Center noted "Interests in the main Hawaiian Islands should monitor the progress of Norman over the next couple of days." Infrared satellite data at 4:25 a.m. EDT (0825 UTC) on Sept. 6, from the Moderate Resolution Imaging Spectroradiometer or MODIS instrument aboard NASA's Terra satellite showed coldest cloud top temperatures in Norman completely circled the eye in a very wide band. On Sept 4, the MODIS instrument aboard NASA's Aqua satellite showed a band of strong storms that circled the center was much thinner. As Norman intensified, the stronger storms expanded further out from the eye. That powerful band of thunderstorms showed coldest cloud tops had temperatures near minus 70 degrees Fahrenheit (minus 56.6 degrees Celsius). NASA research has found that cloud top temperatures that cold have the capability to generate heavy rainfall. CPHC noted that "large swells generated by Norman will continue to build across the Hawaiian Islands through Thursday. Large and potentially dangerous surf is expected along east facing shores through at least Thursday night, Sept. 6."